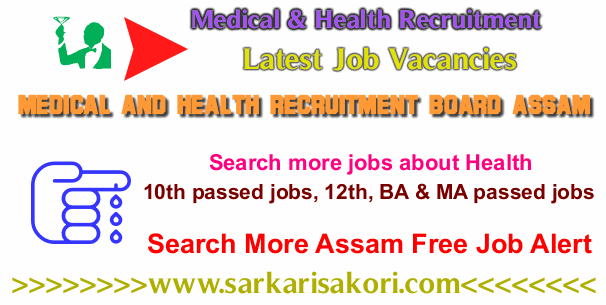 Medical and Health Recruitment Board Assam 2018 notification about for filling up following Inspector of Drugs jobs under Assam Health Recruitment Section. Number of Post: 12 Nos. Medicine with specialization in Clinical Pharmacology or, Microbiology from a University established in India by law. Desirable Qualification: Preference will be given to candidates having the uniformly good academic qualification and experience in handling legal matters. Personnel (B) Department’s Office Memorandum No. ABP.06/2016/04 Dated 03/03/2016 with corrigendum No. ABP/06/2016/07 Dated 26/09/2016. defects or bodily infirmity likely to hamper the efficient performance of his/her field duties in different difficult terrains like hills, dense forest, and riverbed etc. The candidates shall undergo a medical examination before the appointment to the service. The application form prescribed by the organization only shall be considered and candidates fulfilling all the advertisement of the respective posts shall be called for a Screening test / Viva-voce interview where necessary as decided by the organization. Screening test (Multiple choice objective type is written examination) which will be notified in due course. Application Fee: A Treasury Challan of Rs.250/- for General category candidates and Rs. 150/- for SC/ST/OBC/MOBC candidate should be deposited only through Treasury Challan in the Head of Account may be read as ''0210-Medical and Public Health-01-Urban Health Services-800-Other Receipt'' instead of “2218-Medical and Health Recruitment Board/Major Head-2210-Medical and Public Health“. Candidate having BPL certificate: Fee Nil. Interested and eligible candidates may apply in the prescribed standard form of application along with all required documentation (self-attested copies of certificate /mark sheets + 1 copy of the recent passport photo) should be reached the following given address within time. ''To the Chairman, Medical and Health Recruitment Board, Assam, National Health Mission, Saikia Commercial Complex, Christian Basti, Guwahati-781005''. Assam Secretariat Admit Card 2018 Download. Last Date extended: 05-02-2018 12-02-2018. You will be interested more jobs in Medical and Health Recruitment Board Assam 2018.